From the outside, Shanley Pavilion looks like the kind of shed someone would store their lawnmower in during the winter. When you step inside the structure between performances, it’s devoid of light because every surface, even the windows, is painted black. Shanley looks like it was abandoned years ago. It’s hard to believe that anything exciting has ever happened in such a dark and small place, yet it currently hosts a constant rotation of fine arts performances, from comedy groups to dance troupes to theatrical productions. But most students don’t know just how versatile this space truly is. Originally built in 1943, Shanley Hall housed a dining hall and recreation center during World War II for the men of the V-5, V-8 and V-12 Navy Programs. Between the war and the early 1970s, it became two classrooms for post-war students, then a lunchroom for commuters, a university book store and even a student-run hippie coffee shop called Amazing Grace. Despite the lack of appreciation, Shanley remained on campus as the university tore down and replaced other buldings. After a short stint as the home of the Interpretation Department’s Food and Fiction Dinner Theater Program, it became a popular site for all kinds of student productions. In fact, various different groups book Shanley almost around the clock. According to Communication freshman Jeremy Pesigan, performance groups often step in Shanley on Sunday afternoon, right after the previous group has performed their show and broken down their own set. Then, they only have a week to put a new set together, have dress rehearsals, perform their show and break down their set. By that time, the next group will be waiting to move in, starting the process all over again. But no one could have foreseen Shanley becoming the creative hub it is today – the building was never supposed to sustain anything more than the barracks of NROTC. According to Harvey Young, chair of the Northwestern Theatre Department, the building was meant to be temporary, but over time the Northwestern community repurposed it. While Shanley has managed to stick around, it’s also started to break down. In 2004, a a falling light hit a Northwestern senior, who had to go to the hospital. Two different renovations, one in the summer of 2002 and one during the 2005-2006 school year, were desperately needed. 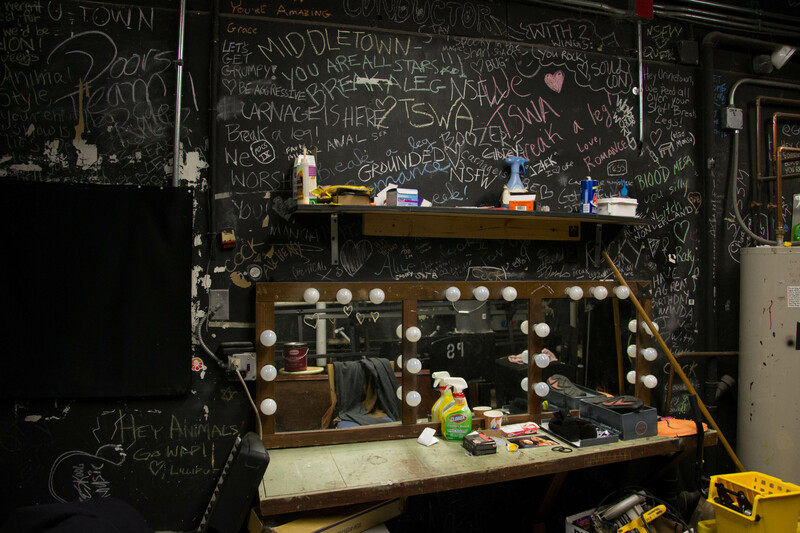 According to current students, Shanley needs further repair – the dressing rooms are falling apart, toilets break in the middle of shows and the floor is patchy from all the different sets. “There are screws and hooks in the ceiling where we don’t know where they came from or if they’re going to fall out if we try and tie something to them,” says Communication junior and StuCo equipment manager Isadora Porte. Describing what sounds like a quirky shot in a Wes Anderson movie, Strauss says the only way to control the heat is to stand on a toilet in the boy’s bathroom and pull a lever from the ceiling. Norris University Center has controlled Shanley since the 1970s, but Young thinks of it as mostly a “student-controlled space.” Besides the check-ins that happen for an hour between shows, the maintenance staff comes in three days a week just to clean the bathrooms and replace the paper towels. This gives student performance groups more freedom to create, but has also contributed to the breakdown of the building, as students are responsible for the majority of the cleaning and upkeep. But according to Communication sophomore Chloe Howard, it’s all part of Shanley’s charm. There have only been four major renovations in the building’s 73-year history, and another is definitely needed. But until then, Shanley will continue to serve as the dysfunctional yet beloved home to many of NU’s student productions.